If you're new to driving, the idea of maintaining a car can seem a bit overwhelming. 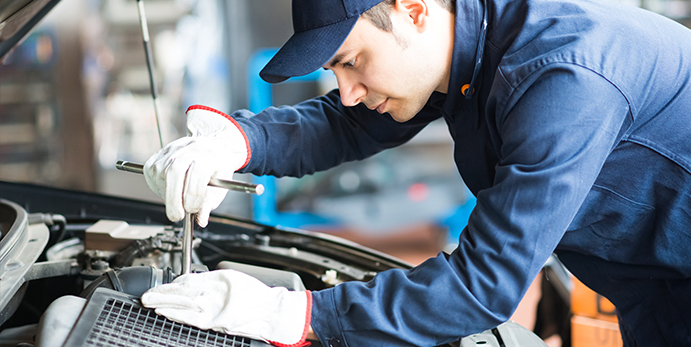 After all, vehicles have thousands of moving parts, so there's a lot that can go wrong if you're not mindful of some car maintenance basics. Fortunately, with a little bit of foresight, you can take all the steps necessary to keep your car running safely and efficiently for many miles to come. One of the most basic aspects of maintaining a car is having its oil changed regularly. After all, your car's engine (which contains many moving parts) needs to be well lubricated in order to run smoothly. Over time, the oil becomes dirty and sludgy, which can cause damage to your engine. You'll want to check out your vehicle owner manual to determine how long your car should go between oil changes, but most newer vehicles can go anywhere from 5,000 to 9,000 miles between oil changes. Your oil change shop or dealership might tell you to come back for another oil change in 3,000 miles or three months, but due to higher quality oils used these days, that practice is no longer necessary. Modern vehicles have a dashboard light that will come on when it's time for your next oil change. Even more advanced cars will come equipped with an on-board computer that will provide you with a digital read-out of your remaining oil life. Even if your car doesn't come with these technologies, you can always test your own oil by pulling out the dipstick from your engine; a dark, sludgy appearance indicates the need for an oil change, whereas a smooth, lighter color is usually a sign of clean oil. You'll also want to take measures to ensure that your tires are in safe operation. This means taking the time to check your air pressure every few weeks (especially during times of fluctuating temperatures) and inflating/deflating as needed. Approximately every 7,500 miles, you'll also want to have your tires rotated. You can do this at the same place you get your oil changed (a quick service shop or your dealership); rotating your tires helps to ensure that they're evenly worn, which will prolong the life of your tires and make your car safer to drive. Just be sure to replace your tires when the tread becomes too worn; usually, if you can place an upside down penny in your tire tread and see the top of Abraham Lincoln's head, this is a sure sign that your tires are too worn and in need of replacement. Last but not least, you'll need to be proactive about caring for your brakes. Every 30,000 miles or so, your brake pads will likely need replacing (of course, this will vary based on how much freeway versus city driving you do). Failure to replace your brake pads as needed can ultimately lead to your brake rotors and/or calipers becoming warped, which will be much more expensive and labor intensive to replace or repair. Generally, you can tell when your brakes need serviced by listening for abnormal noises or vibrations coming from the brakes or steering wheel when you press the brake pedal. Specifically, be on the lookout for a squealing noise that doesn't go away, or a grinding noise. These are just a few of the basics you'll need to be aware of when it comes to car maintenance. If you're ever in doubt, you can always refer to your car owner manual for further information on the maintenance your car needs at various mileage intervals. For more information on staying safe behind the wheel, consider taking an online driving safety course.